After the bus ride last night, the only thing I wanted to do was sleep but the hostel owner convinced me to join a land tour of the Nasca lines. At breakfast, the tour guide ordered me to the front desk. I was very annoyed since I was still eating. He then tried to sell me his package as I was not pleased with him, I was non-committal. At breakfast, I met a lady from the US. Her name was Ida* (not her real name). 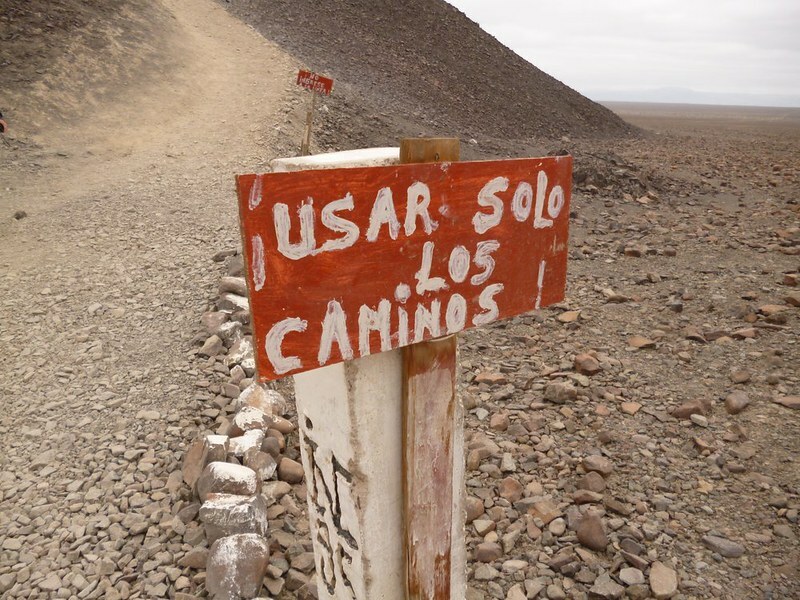 Since she wanted to go on the land tour to the Nasca lines and the cemetery, I said I would too. Ida said that she did not have a chance to take photos of the lines since her camera batteries ran out yesterday when she was on the plane ride. The land tour turned out to be quite fun and the guide was nicer when not trying to sell his package. 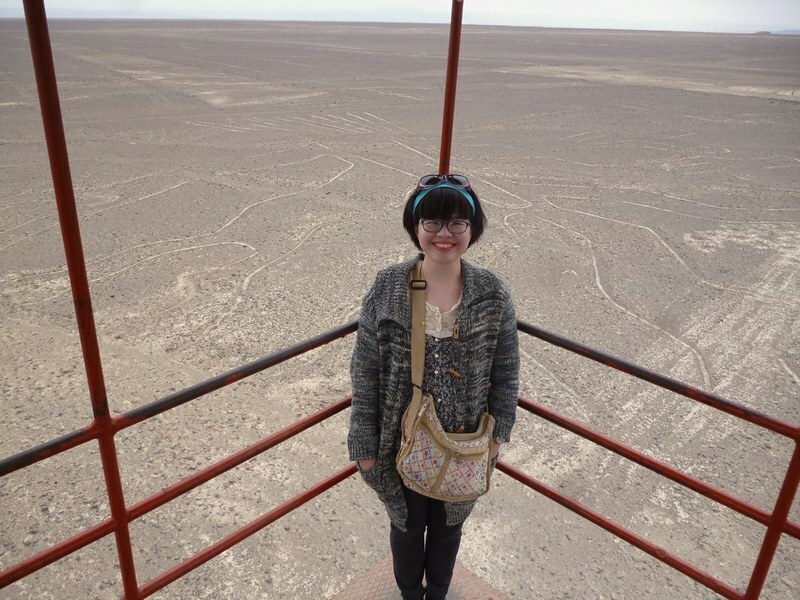 Our first stop was a lookout for the Nasca lines. 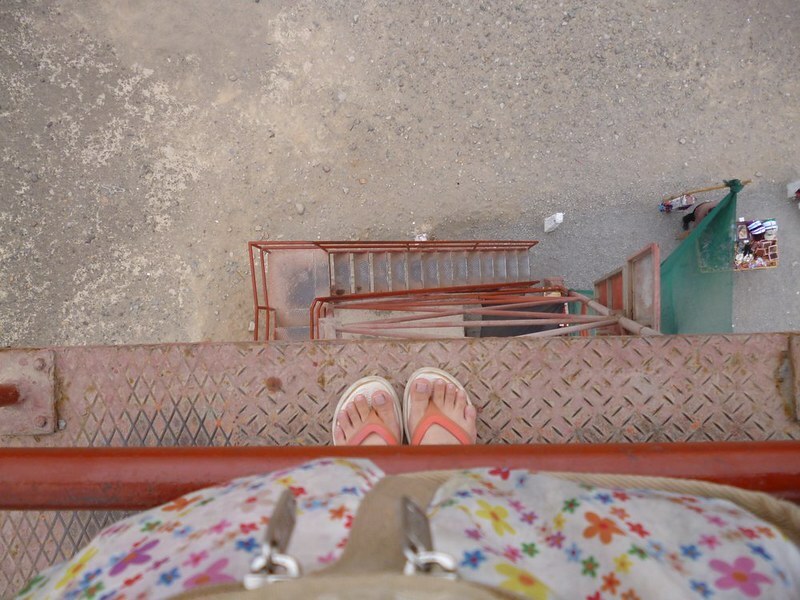 The lookout was a metal structure with a narrow winding staircase. From that look out, we saw a hand, an upside down tree and a lizard which are part of the Nasca lines. From that high (which is not much), the Nasca lines do not look that impressive. Up close, I saw that the ditches were really shallow and narrow. I imagined something as impressive as crop circles. Next was the Palpa lines which had an adorable set of people etched on the side of a sand hill. My camera could not capture the figures so I give you the photo from the exhibit. A long long drive away was the cemetery. During the ride, I fell asleep and woke up to find a desert around us. The cemetery had tombs of some ancient people. 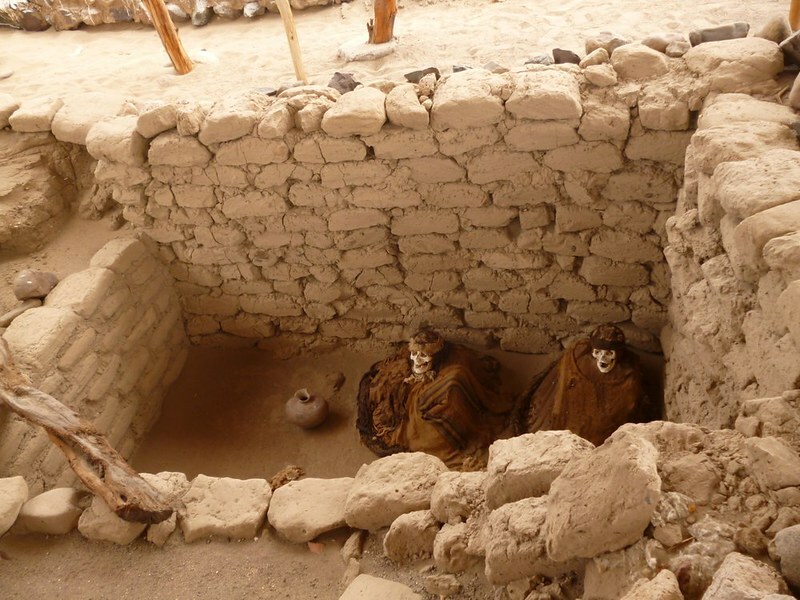 These folks were mummified after they died and laid in little stone tombs. Many of them still had their long dreadlocks which were curled around their bodies. Tomb raiders had stolen most of the beautiful pottery and left some of the bones and clothes above ground. We did see bits of human bones lying around. 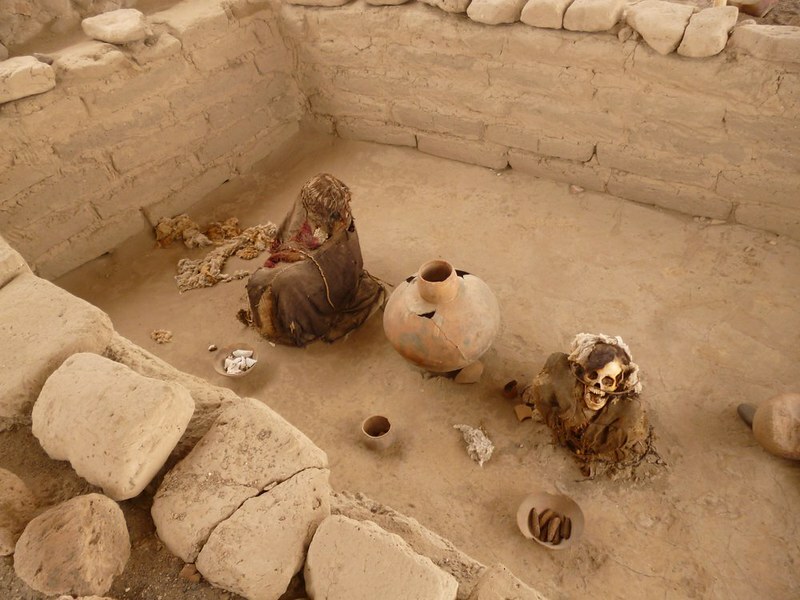 Surprisingly, the bodies were left in their crouching positions in their tombs, as if the caretakers do not mind them being exposed in the open air. Our last stop was the ancient aqua ducts. 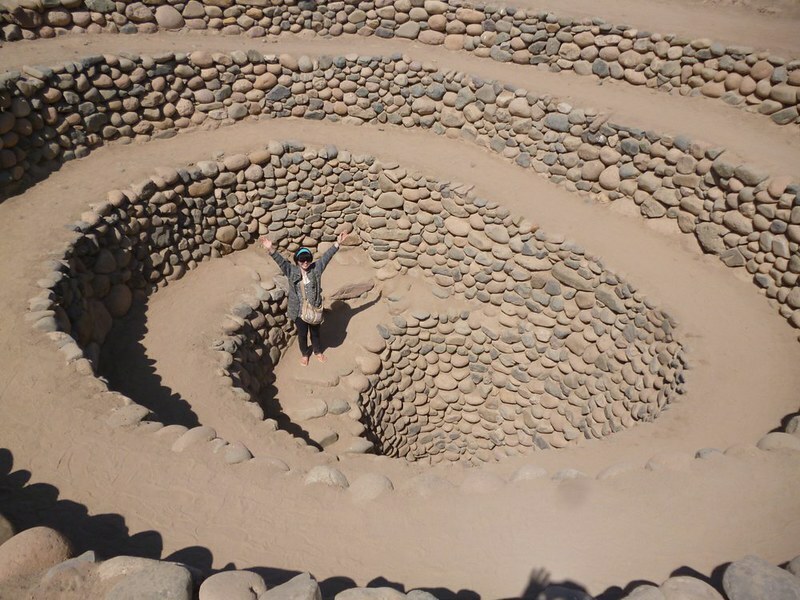 This was the most impressive since some of the twenty spiral aqua ducts went tens of meters deep into the ground. The total of the tour was 150 soles per person. 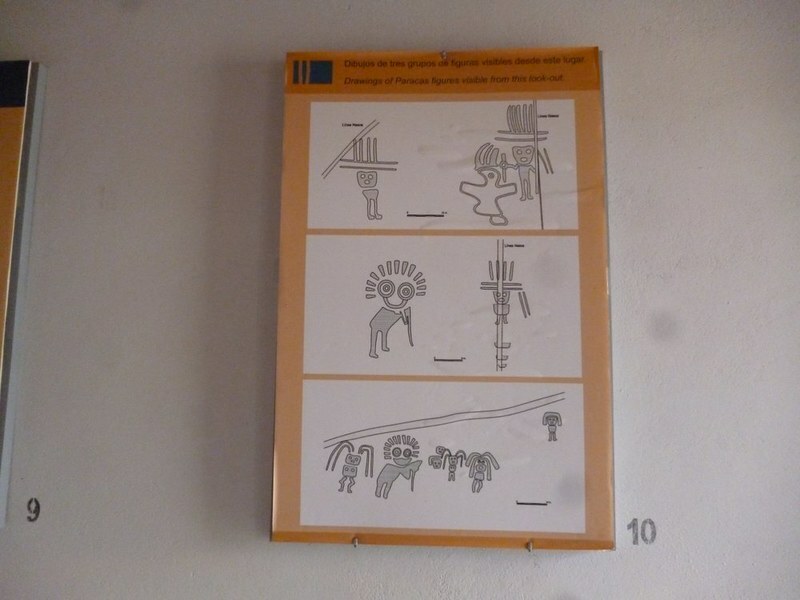 To fly to see Nasca lines or not? After seeing the Nasca lines up close, I am thinking of not spending my time and money on a flight over the lines. Ida said that the planes do not fly if it is cloudy. This means that people who booked slots in the morning are forced to wait until the sky clears (about 1pm today) and those with later slots will need to wait even later. Another reason that I do not want to take the plane is that it does a lot of flying manoeuvres so people on both sides and see the lines. After my motion sickness episode, I do not look forward to that. My plan for tomorrow is to take a morning bus to Ica then if there are cheap buses to Lima, I will head to the capital. If not, I will spend a night in Ica then take the bus on the following day.